I became pregnant with my first child in 1991, the year the “Mozart effect” sent millions of ambitious parents running to CD stores. The theory was coined by psychologist Frances Rauscher, who claimed that listening to classical music boosts a child’s brainpower. As a mother-to-be I joined the cult following, holding headphones with twinkling and melodious sonatas to my belly. Now, the question is: Did it work? Did Mozart make my daughter smarter? While studies since have shown mixed results on Wolfgang Mozart’s particular brain-enhancing qualities, the link between music and childhood development is indisputable. According to Harvard psychologist Howard Gardner, a child’s musical intelligence is of equal importance to their logical and bodily intelligence. Gardner states that engaging with music and sound play heightens a child’s day-to-day cerebral abilities such as language, numerical skills, memory, attention, and problem-solving. Since babies and toddlers perceive the world around them through colors, shapes, and sounds, Gardner’s theory on music intelligence holds significant truths. Think back to being taught that blaring sirens warn of emergency, a dog goes “woof”, and a doorbell ringing signals an arrival. 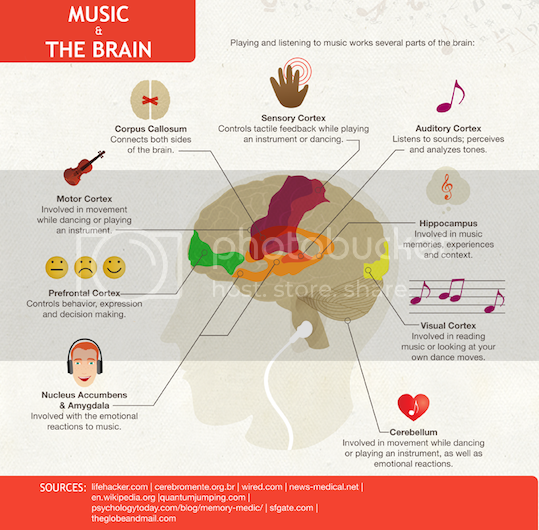 Music and sounds are a relatable medium from which a child can recognize rhythmic patterns, melodies, and the diversity of instruments—skills that set the foundation for everyday activity and elevated brain functioning. A further study at Northwestern University’s Auditory Neuroscience laboratory concluded that music particularly enhances speech and communication. The study found that the level of precision used in processing music (discerning, pitch, key, and instruments), is even higher than that of processing speech. Therefore, musical studies can lead to earlier literacy and the ability to communicate at an earlier age, whether that be through language, body signals, or sounds. I used music as a means of communicating emotion with my children. With my baby in my arms, I would dance around the living room to The Beatles to convey upbeat happiness, a Bob Dylan ballad to communicate sadness, or a James Taylor tune to evoke contentment. These were unique moments with my children where we could connect emotionally on a non-verbal level. As my children grew older I encouraged them to make their own music on pots and pans, produce at-home renditions of Les Miserables, or have a dance party with friends. They used music as a means of expression. I built NY Kid’s Club from the experiences I had with my own children. Since music was an integral part of my parenting method, I infused NY Kid’s Club curriculum with dance and sounds. In our Musical Tots and Musical Kids classes, a professional guitarist and talented singer introduce children to jazz, rock and roll, nursery rhymes, and sing-alongs, for example. Take every opportunity to introduce your child to music early in life. It not only contributes to future success—it makes for a more joyful journey. This entry was posted in Parenting Tips and tagged music for kids, ny kids club, Parenting on July 7, 2016 by Kidz Central Station. Most kids respond innately to music—whether they’re dancing, singing along to a song, or covering their ears. As your child grows and develops, their musical world will expand—the sounds they notice will be more specific, their fine motor skills will allow exploration of smaller instruments, and they may even be able to listen to an entire song (most days!). Music is organizing. Rhythmic patterns, melodies, and tempos all combine to make a cohesive whole. A certain song might help your child get out of bed in the morning or they might always dance to a particular song or genre of music. Have you found your child is more responsive to upcoming changes if you sing about them? (Use a simple melody like “Twinkle, Twinkle” or “Row your Boat”). Listening to a specific kind of music at a specific time can help your child anticipate and prepare for what comes next (i.e. a Beatles song after dinner to transition to bathtime). Music is calming. Lullabies at bedtime are always a great place to start. You might also sing with your child—try one song, progressively slower and slower, so they can really feel their breath and body relax. Be open to trying different kinds of music—Classical, bluegrass, New Age, slow jazz, the possibilities are endless. Another fun idea is to ask your child to find one little sound and listen to it until it goes away. As long as this is approached playfully, any sound will do—a bird outside, the elevator’s rumble, or music heard down the hall. Music is playful. Dance, play, sing with your child! it’s not about being “perfect” or “doing it right”, it’s about connecting with your child in a stress-free way with no expectations. Music provides a way to be creative and explore, and will give your child the confidence to try something new and improvise. When we improvise—whether in life or in music—we learn how to adapt to changes, initiate new ideas, and be present in each moment. So grab some maracas and play along together with some recorded music, use some scarves and dance around to the beat, or see who can hold a note the longest. It’s all about fun, connection, and spontaneity. By Maya Benattar, MA, MT-BC, LCAT. Maya is a board-certified and licensed music therapist with an NYC-based private practice, where she works with children of all ages and needs and their families. Her holistic, child-centered approach utilizes individualized music-based interventions to address social, emotional, and developmental needs. For more information, visit Maya’s website, follow her on Twitter or like her on Facebook. This entry was posted in Parenting Tips and tagged child development, Music, music for kids on June 22, 2014 by Maya Benattar. Listening to quiet music at nap time helps children relax and prepare for restorative sleep. In addition to singing a few lullabies, adding some classical music to your daily nap routine can improve the quality and length of your child’s sleep! A good nap means a better day for Mom and Dad too, so if you’re searching for a way to calm your child, music is the place to begin. It’s a winning combination- not only does it release the “feel-good” chemical dopamine, soothing and relaxing your baby, but it also engages his or her developing brain! Here are the Top 10 recommendations of relaxing classical pieces for naptime, including works by great composers like Chopin, Debussy, and Brahms. NOTE: This is also a great list for expectant mothers. A baby’s auditory system is fully functional within the womb about twenty weeks after conception, so make sure to fill your third trimester with a mix of gorgeous, soothing classical music and your favorite upbeat, feel-good songs. Alexandra Lamont of Keele University in the UK found that, one year after birth, children recognized and preferred the music they heard in the womb! Carina Zimmerman is one of the co-founders of TLB Music, a children’s music studio and indoor playspace located on the Upper East Side. 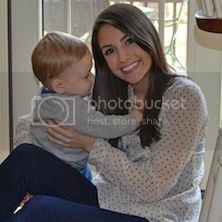 She is also the author of The Bird Feed NYC, TLB’s blog filled with family-friendly music to share, free printables for kids, NYC history, product recommendations, and nostalgic photo collections. This entry was posted in music classes, Parenting Tips and tagged music for kids, naptime on April 4, 2014 by Carina Zimmerman. Is My Child Ready for Flute Lessons? Your child loves music, you’ve tried piano lessons and you bought that plastic recorder, but the interest seems to be fading and the musical community and fun you hoped for is nonexistent –now what? Playing the Flute – What Age is Best? A young flutist can usually handle a “real” instrument –that is, one with a curved-head joint that fits the child’s hands and body. There are several flutes on the market geared towards young children. Although there are instruments available with only a body and head-joint (such as the Jupiter Prodigy pictured above), I recommend getting a complete flute (such as the Trevor James or similar), as it can be played for many years without need for a step-up or replacement instrument. Posture, breathing and hand position. A young flutist learns a series of movements not unlike a little dance –we stand, smile, bow, adjust our feet, and float the flute above our heads before even playing a note. Performing this ritual before each song instills a sense of calm, steady relaxation and sets up the child in an attitude of openness and readiness to play. Parents, you must take up the gauntlet here! It is a rare child who will set their own schedule and find time for regular practice sessions. Just as you set up play dates, dinner time and transportation to school, it is your responsibility to create a little space for music in your busy family life. That could mean having books, stand, instrument, etc. set up in a corner of the living room, and making sure there is time during day for practice. You can listen to your child play their songs and count their repetitions, or ask them to explain a new concept that only they understand. Or you could do a flute set-up with them – keep an eye on their pinky to make sure it’s going to the right place. A partnership is needed here – practice time only takes about 15-20 minutes a day, and will add incalculable benefit to your child’s musical life. And when grandparents come to town imagine their delight when they get hear a new piece! Flute lessons at NYC Flute provide a built in community of peers –there’s always someone to look up to, and someone to show off for in group class! During private lesson the young flutist learns one-on-one according to their own particular strengths and needs, but in group class a whole new set of music-making skills come into focus that can’t be duplicated in any other way: Listening, ensemble skills, performance confidence –and getting to play with your friends, what could be more fun? Book a class today on KidzCentralStation.com, here! This entry was posted in kids activities, music classes, Skills Training and tagged Children's Flute lessons, flute, Flute Class, Flute Instruction, Kid's Flute Lessons, music classes, music for kids, Suzuki Flute School on March 19, 2014 by Laura Thompson. 1) Take a familiar song and make up completely irrelevant lyrics. Children love being silly and getting a giggle out of it. Start with a familiar tune such as Old McDonald. If you are talking about food at the moment, sing something like, “Daddy loves to eat broccoli, mommy wants tofu.” The more random the better. Watch your child get creative and be prepared to laugh nonstop. 2) Boogie down to a CD. You do not need to limit your child to only children tunes. That Beatles CD you have will work perfectly fine. Switch it up between jazz, country, pop, classical, anything you have in your library. Dance accordingly to the music. Move faster when the music is faster, and vice versa. Or you can really have fun by doing the complete opposite! 3) Paint a story with the music you hear. Instrumental music is better suited in this scenario. Does that flute sound like a bird tweeting? Or perhaps all those low sounds from the bass players sound like elephants stomping? Create a story based on all the different sounds and see how many different versions you can come up with. Tap on a tabletop or any hard surface along with the music. Make up rhythms that either match the music or do not match at all. Let them go at it and see how much your child enjoys this. Note: probably not the best activity to do if you have a headache! 5) Make music with your surroundings. With all the leaves falling off the trees, you can make different pile sizes from the leaves and jump between the piles. It may not be your standard melodious tune, but it sure creates a new kind of sound. Or, gently tap on the mugs that you are drinking out of. The more family members that have a mug, the better. Get resourceful and see how many different things you can make a sound with. Just a couple of ides to get you going. Music isn’t about just listening to a concert or playing a musical instrument. Weave all these different ways into your child’s daily routines. You will be amazed on how they will begin to take the lead and come up with new ways of making music themselves! This entry was posted in music classes and tagged music for kids on November 11, 2013 by Natalia Huang Piano Studio. 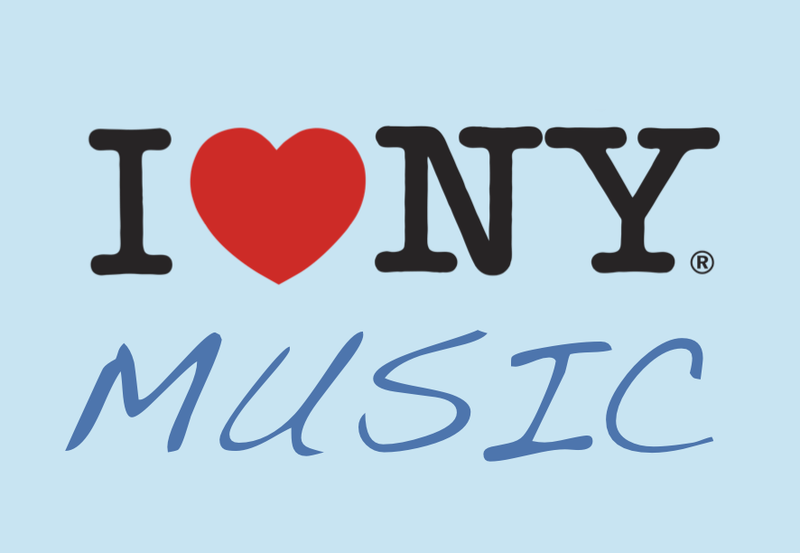 NYC kids come from one of the coolest musical cities on the planet. Our city is home to a diverse history in so many genres: Jazz, Hip Hop, Broadway, and Punk are just a few styles that reached important milestones in the Big Apple. New York City is also the hometown of musicians such as Simon and Garfunkel, George Gershwin, Barbra Streisand, Jay Z, and the Beastie Boys. Being surrounded by such a rich music history and culture gives NYC parents the perfect opportunity to raise musically inclined and diversely cultured kids. So many options are just a subway ride away! The Apollo Theater is located on West 125th street in Harlem. Many famous musicians got their start at The Apollo, including several prominent Jazz musicians. Ella Fitzgerald made her singing debut there at age 17! Other Jazz greats who played at the theater: Billie Holiday, Miles Davis, John Coltrane, Thelonius Monk, and the Count Basie Orchestra. Motown stars to grace the stage: The Supremes, The Miracles, Marvin Gaye, The Temptations, The Four Tops, Gladys Knight and the Pips and Little Stevie Wonder. The Apollo has an education program with shows and workshops designed especially for families! The New York City Ballet makes it easy and affordable to introduce your kids to ballet. Visit Lincoln Center on one of their “Family Saturdays” with children 5 and under for only $20 per person! The program features short works appropriate for young audiences and teaches kids about music, choreography, and classical dance. The NYCB also hosts pre-performance children’s workshops for children ages 5-8. The caliber of NYC’s street and subway musicians is extraordinarily high! Some of my most vivid music memories from my past 9 years in NYC are of subway performers, musicians in the park, or the a-cappella group that sings in my neighborhood. Washington Square Park is a vibrant hub for local artists and musicians: bagpipe players, bluegrass bands, jazz trios, pianists, sitar players and solo guitarists are just a handful of the types of musicians I’ve listened to in this Greenwich Village park. Visit on the weekends and you’re guaranteed to experience a variety of performances! Although you should wait until your kids can comfortably sit through a long performance, don’t be scared to introduce opera to your kids! Explain what it is in this simple way: opera is a kind of theatre in which the story is told through music and song. Elements that help tell the story: stage and scenery, costumes, the lyrics that are sung, and the music played by the orchestra. Also, to make for the most rewarding experience, learn about the story of the opera with your kids before attending! Mozart’s The Magic Flute is an excellent first opera and returns to the Met this December. New Yorkers love Broadway and the passion starts early. There are so many kid-friendly shows to introduce musical theater to your children! A few great options out right now: Annie, The Lion King, Matilda, Peter and the Starcatcher, and Wicked. Musical theater elements to discuss with your kids before attending: the story, costumes, makeup, scenery, lighting, lyrics, and music. Also, don’t forget to explain what to expect at the show: finding your seats, the theater’s darkness, watching quietly, reading the playbill, intermission, and applause. The LES is home to many intimate performance venues filled with talented, emerging artists. In the late 1960s/early 1970s, the punk scene grew in Lower Manhattan in clubs like the famous CBGB on Bowery. Although CBGB is no longer open, there are still lots of places to check out live music with a low (sometimes free) cover charge and relaxed dress code. The Living Room on Ludlow Street is family-friendly and offers special kids shows appropriate for all ages. They are moving in October- so hurry to visit them at their current location! Carnegie Hall is one of the most prestigious and celebrated concert venues in the world but don’t let that intimidate you! They have a special program called Carnegie Kids that presents shows that are appropriate for kids ages 3 – 6. Radio City Music Hall opened its doors on December 27, 1932 and has been one of NYC’s most popular entertainment venues since. The perfect show to attend with children is the famous annual Christmas Spectacular featuring the Rockettes. The Rockettes were originally formed as the Missouri Rockets in 1925 and in the early 1930s were brought to NYC by Samuel Roxy Rothafel to perform at his Roxy Theatre. When Rothafel opened Radio City Music Hall along with Rockefeller and David Sarnoff, the group followed, were renamed “The Rockettes” and even performed on opening night! 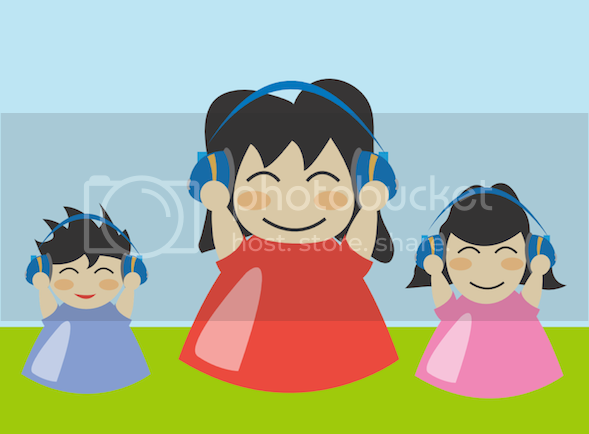 Listening to music with your kids benefits their development and allows you to connect and communicate with them, even before spoken language is learned! As infants and toddlers, it stimulates their brains, soothes nerves, and inspires creativity. When your children get a bit older, music is particularly helpful with verbal expression, emotional expression and auditory development. Encourage imaginative thinking by creating music-inspired art or making a storyline to follow the music. For example, in our classes, our students listen to live classical music while drawing with crayons in response to what they hear! You can support verbal and emotional expression by giving your kids a music vocabulary. Begin with simple language to describe musical terms: is the music high or low (pitch), slow or fast (tempo), loud or soft (dynamics) happy or sad (emotion)? Graduate to trying to identify particular instruments and composers. click on the links below each song to listen to and learn more! Heavily used in film and television, this song from Norwegian composer Grieg’s Peer Gynt is familiar to lots of non-musicians. The accelerating tempo keeps you listening on the edge of your seat in suspense and is perfect for creating music-inspired art or a storyline! Debussy’s mesmerizing composition is ideal for relaxation, daydreaming, and naptime. To me, the trickling piano notes sound like a waterfall gently flowing into a babbling stream. Ask your kids to describe the types of nature scenes, animals, and people they imagine when hearing the music. This orchestral interlude from Rimsky-Korsakov’s opera The Tale of Tsar Saltan is very fast and short- most performances last only about a minute and a half! A great way to use this composition is as a “clean-up” timer. See if your kids can clean up before the music ends. You’ll easily recognize this aria from Bizet’s opera Carmen– it is one of the most popular and most beautiful of all time. In class, we use the setting of the opera (Seville, Spain) as inspiration and snap castanets and dance flamenco-style in response to the music. Teach your kids some basic flamenco moves- hand clapping, foot stomping, wrist twirling – and get dancing! The shimmering glissando in this movement from Saint-Saens’ Carnival of the Animals is completely entrancing and calming. It’s one of our favorite classical pieces to play in class! Before listening, ask your kids what they might see in an aquarium. (Fish swimming, sea grass swaying, coral, shiny rocks, bubbles rising, etc.) This is perfect for naptime and creating music-inspired art. This entry was posted in kids activities and tagged activities, education, infant, kids' learning, music for kids, toddler on July 15, 2013 by Carina Zimmerman.